The key fear is that the Obama administration’s ‘humanitarian’ response may result in an even more destabilizing effect on Lebanon. The small country has largely avoided blowback from Syria’s civil war, despite skirmishes in Tripoli, the Sunni-dominated northern Lebanese city, its second-largest, close to the Syrian border, and despite a high-profile blast last October that killed the country’s top intelligence official, Wissam Hasan. Already this week, however, there have been clashes between Salafist supporters and Hezbollah supporters in Sidon, Lebanon’s third-most populous city just south of Beirut. The skirmishes came after relatively hardline Sunni clerics in the city called for jihad in Syria to support the anti-Assad rebels. After all, the U.S. decision to back rebels fighting against Libya’s longtime strongman Muammar Gaddafi by providing arms to anti-Gaddafi rebels and enforcing a no-fly-zone ultimately backfired when many of those arms ended up in the hands of Tuareg separatists (and other more radicalized fellow travelers) that resulted in a war that thrust Mali into war for a year and, despite French intervention to eject Islamic fundamentalists from power in northern Mali, still threaten to turn the entire Sahel region into a fertile battleground for Islamic jihadism. If the Obama administration didn’t anticipate the adverse consequences of the Libyan decision, intervention that both Rice and Power enthusiastically urged, there should be little faith that the U.S. government understands the downside risks — in Lebanon and elsewhere — with respect to its intervention in Syria. Sadly, the risks to Lebanon are now paramount. Although nearly three-quarters of Syria’s population is Sunni Muslim, only 13% of the population is Shi’a, and many of those are Alawites, who have dominated Syria’s government since 1971 when Hafez al-Assad, Bashar’s father, took control of Syria. A significant minority (around 10%) of Christians also live in Syria, and have at times been key players in the Assad regime. Much of the Alawite and Christian Syrian population inhabit Syria’s northern coast near the northern border with Lebanon. As in Iraq, a significant minority of Kurds (around 9% of Syria’s population) have essentially formed their own autonomous zone far from the heart of the fighting in Syria’s civil war. But many of the other ethnic and religious groups in Syria live in the western part of the country, and much of the fighting has likewise taken place close to the Lebanese border than to the Iraqi border. Some of the worst fighting in Syria has taken place in its three largest cities — Aleppo, Damascus (Syria’s capital) and Homs — and two of those cities lie within an hour’s drive or less of the Lebanese border. But the ties between Syria and Lebanon go perniciously deeper. Syria’s army first occupied Lebanon in 1976 during the Lebanese civil war, and it continued to play an oversized military and political role in Lebanon, so much so that Assad essentially held veto power over major Lebanese policy decisions. That ended rather abruptly in February 2005, when Syrian agents were implicated in the assassination of Rafiq Hariri, Lebanon’s former prime minister. The resulting outcry led to Syria’s prompt withdrawal from Lebanese territory. Since 2005, Lebanon’s politics have been organized around the two movements that developed in response to the Hariri assassination — the relatively pro-Syrian ‘March 8’ bloc and a relatively anti-Syrian ‘March 14’ bloc, each named after competing demonstrations in March 2005. The membership of each bloc is relatively complicated, and each bloc includes both Muslims and Christians, in light of the highly choreographed nature of Lebanon’s electoral process and its government. Under Lebanon’s post-war constitution, half of the 128 seats in Lebanon’s national assembly (مجلس النواب) are allocated each for Muslims or for Christians, with established quotas to guarantee seats for each of Lebanon’s 22 confessional sects. Moreover, its constitutional also requires that prime minister shall be Sunni Muslim, the president shall be Maronite Christian and the speaker of the national assembly shall be Shi’a Muslim. But in general, the ‘March 14’ alliance includes most Maronite Christians and many Sunni Lebanese leaders, and the ‘March 8’ alliance includes Hezbollah and other Shi’a Lebanese groups, a handful of Maronites, many of Lebanon’s Greek Orthodox politicians, and competing Sunni Lebanese leaders. In the immediate aftermath of the Hariri assassination, the ‘March 14’ bloc took power in Lebanon under prime minister Fouad Siniora. The ‘March 14’ coalition also won Lebanon’s June 2009 parliamentary elections, and Hariri’s son, Saad Hariri, became prime minister shortly thereafter. But Druze leader Walid Jumblatt switched the support of his parliamentary allies from the ‘March 14’ bloc to the ‘March 8’ bloc two years later in June 11, which resulted in the ‘March 8’ government and the appointment of Najib Mikati as prime minister. Since the start of the Syrian civil war, most of Lebanon’s political elite — across both the ‘March 8’ and the ‘March 14’ blocs — have agreed that Lebanon’s top priority should be to keep out of Syria’s conflict at all costs. When Mikati resigned as prime minister earlier this spring over tussles related to the failure of Lebanon to agree to a new election law, his successor Tammam Salam was acclaimed prime minister by both ‘March 8’ and ‘March 14’ supporters in Lebanon’s parliament. Salam, a moderate formerly served as Siniora’s minister of culture, comes from an elite Sunni Lebanese family, and he’s cultivated close ties to both major political alliances (read some of his thoughts from 2006 in one of the leaked U.S. state department cables here). The one glaring exception to Lebanon’s national unity vis-à-vis has been Hezbollah. Though most Americans know Hezbollah chiefly in for role as an anti-Israeli militia that receives support from Iran’s Shi’a government, it plays a much more dynamic and important role in Lebanon’s domestic affairs. Among the many catalysts of Lebanon’s civil war in the 1970s was the growing migration of Palestinians throughout the Levant into Lebanon, and Yasser Arafat’s decision to migrate the headquarters of the Palestinian Liberation Organization from Amman to Beirut after the Jordanian government determined to chase Arafat out of the country following the 1970-71 ‘Black September’ conflict that plunged Jordan into civil war for a brief nine months. The increasingly Palestinian presence in Lebanon had several destabilizing effects, not least of which was drawing the ire of Israel, which first occupied south Lebanon in 1978. Though it’s impossible to explain adequately the role that PLO and regional politics played in hastening the Lebanese civil war, the example should serve as a caution to anyone who doubts that today’s conflict in Syria could likewise plunge Lebanon back into sectarian violence. Hezbollah itself emerged in the 1980s as a resistance force dedicated to ending Israel’s occupation of south Lebanon, a task that it finally accomplished nearly three decades later following the end of the 2006 war with Israel. Hezbollah’s emergence personified the growing political relevance of Lebanon’s growing Shi’a population. Disadvantaged politically and economically during the ‘golden era’ of Lebanon from the 1940s to the 1960s, when Sunni Muslim and Maronite Christians dominated Lebanese government and business, southern Lebanon had always been the poorest and least developed part of the country. That disadvantage became even sharper during the Lebanese civil war and its aftermath while Israeli military forces continued to occupy it. Accordingly, Hezbollah’s role in Lebanon throughout the past three decades has grown from a militia into something much more: both a civil society group and a vehicle for political representation, with Hezbollah serving as a vector of socioeconomic support in southern Lebanon and the Beka’a Valley and Nasrallah asserting the political will of Lebanon’s Shi’a population in the national government. Although many were dismayed by its essentially unilateral decision to drag Lebanon into war against Israel in 2006, its success in forcing an end to Israel’s Lebanese occupation has generally served to strengthen Hezbollah as a political force ever since. Though the 2006 war ended relatively quickly and with a result that boosted Hezbollah’s — and Nasrallah’s — political capital, Hezbollah’s military capability means that it rivals the secular Lebanese army in terms of its capability to project force, which also makes Hezbollah the entity with the greatest ability to undermine Lebanon’s always fragile national institutions. It also means that its May decision to openly back Assad has been the single-most worrying turn of events in Lebanon since the Syrian civil war began, and ‘March 14’ alliance leaders (and no shortage of ‘March 8’ figures) are calling on Hezbollah to withdraw from Syria. 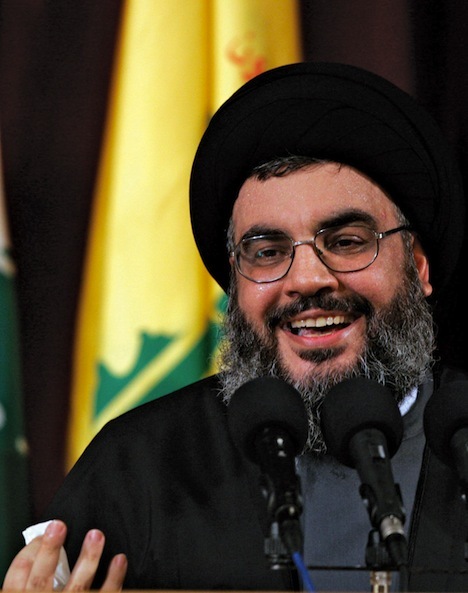 Now that the United States has announced it is standing with the anti-Assad rebels, the political costs of Hezbollah’s backing down are precipitously higher, which leaves Lebanon at even greater risk. That means that it will fall not only on Salam and Lebanon’s caretaker government, but upon Mikati (whose political base is in Tripoli), Hariri (whose political base is in Sidon), and a united front among Lebanon’s Sunni political leadership to work to keep the most radical Sunni partisans from following Hezbollah’s lead by providing countervailing military support for the anti-Assad rebels or, worse, open clashes on Lebanese soil against Hezbollah.